Organic Almonds, Organic Tapioca Syrup, Organic Dark Chocolate (Organic Cocoa Liquor, Organic Cane Sugar, Organic Cocoa Butter), Organic Brown Rice Crisps (Organic Brown Rice, Organic Brown Rice Syrup, Salt), Pea Protein Crisps (Pea Protein, Pea Starch, Rice Flour, Calcium Carbonate), Brown Rice Syrup, Organic Dried Blueberries, Organic Dark Chocolate Chips (Organic Cane Sugar, Organic Chocolate Liquor, Organic Cocoa Butter, Organic Vanilla Powder), Organic Chia Seeds, Vegetable Glycerine, Organic Arabic Gum, Organic Agave Syrup, Safflower Oil, Water, Natural Flavors, Sea Salt, Sunflower Lecithin, Mixed Tocopherols (Natural Vitamin E). -Eat one bar as a healthy snack between meals, or two bars for a complete meal replacement. -For best results, follow with 8oz. of pure water. Organic Peanuts, Organic Tapioca Syrup, Organic Brown Rice Crisps (Organic Brown Rice, Organic Brown Rice Syrup, Salt), Organic Dark Chocolate (Organic Cocoa Liquor, Organic Cane Sugar, Organic Cocoa Butter), Pea Protein Crisps (Pea Protein, Pea Starch, Rice Flour, Calcium Carbonate), Brown Rice Syrup, Organic Dark Chocolate Chips (Organic Cane Sugar, Organic Chocolate Liquor, Organic Cocoa Butter, Organic Vanilla Powder), Organic Chia Seeds, Vegetable Glycerine, Organic Arabic Gum, Organic Agave Syrup, Safflower Oil, Water, Natural Flavors, Sea Salt, Sunflower Lecithin, Mixed Tocopherols (Natural Vitamin E), Organic Almonds. 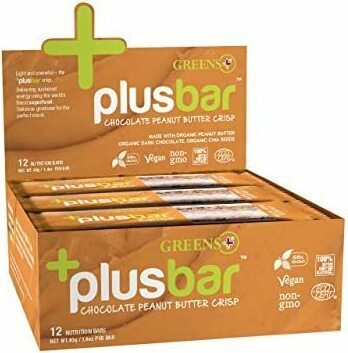 The Greens+ Vegan Crisp combines organic peanut butter, brown rice, pea protein and omega 3 chia seeds with rich, organic dark chocolate that delivers 5g protein, 5g dietary fiber, 740mg omega 3 and only 170 calories. Perfect for athletes seeking an edge, students, travelers, and children of all ages. Contains peanuts. Good manufacturing practices are used to segregate ingredients in a facility that processes other products, which may contain peanuts, wheat (gluten), milk, soy and/or eggs. The Greens Plus Vegan Crisp is gluten-free. Organic dark chocolate (organic chocolate liquor, organic cane sugar, organic cocoa butter, organic vanilla, sunflower lecithin), organic tapioca syrup, organic whole grain brown rice crisps, organic peanut butter, organic omega 3 chia seeds, pea protein crisps (pea protein, pea starch, rice flour, calcium carbonate), brown rice syrup solids, organic agave syrup, organic arabic gum, vegetable glycerine, organic peanuts, safflower oil, natural peanut extract, sea salt, natural flavor.